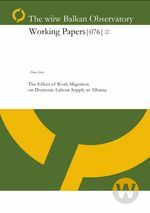 Using information from the Albania Panel Survey 2002-2003, we study the determinants of labour market states (market work, home production, inactivity) of married women in Albania, looking in particular on the effect of husbands’ migrant work activity and the receipt of remittances. We further explore the determinants of joint labour market states of spouses considered in our sample, distinguishing the above three states and work migration abroad in the case of husbands, to account for the possibility that the migrant state of the husband may be endogenous with respect to the state of the wife. Our findings shot what wives of working migrant husbands are most likely to pursue home production, which may be due to weaker labour market attachment of the households sending working migrant men abroad. Our results do not support the view that wives receiving income from family members working abroad choose to consume more leisure as compared with wives lacking such income.